The discovery of a rare 1,000-year-old Viking toolbox containing 14 unique iron tools caused excitement during recent excavations at an old Viking fortress. The toolbox was unearthed in a small lump of soil at Denmark's fifth Viking ring fortress: Borgring. It is the first direct evidence that people actually lived at the site. Science Nordic journalist Charlotte Price Persson became an archaeologist for a day and joined the team of researchers to help clear away the dirt and expose the iron tools. The soil containing the artifacts was removed from the site of one of the four gates at Borgring. The researchers suggest that the tools could have belonged to people who lived in the fortress. It contains an amazing collection of tools which were used around the 10 th century AD. The scans allowed the researchers to see the shapes of the tools and they realized that the toolbox itself was gone – the wood had rotted away over time. However, the placement of the objects suggests that the wooden box was replaced with soil. The discovery is exceptionally rare. 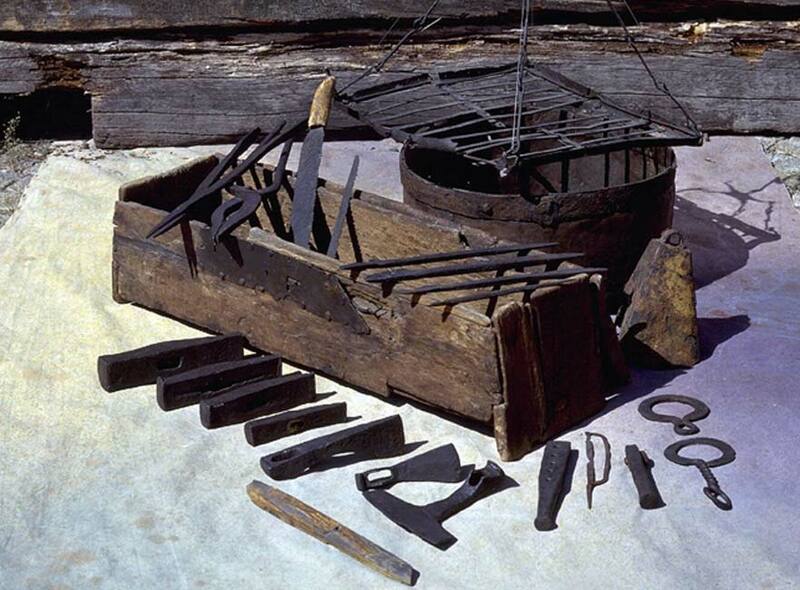 Tools made of iron were very expensive and precious to the Vikings. It is strange that nobody had found them before and melted the objects down to repurpose the iron. The archaeologists believe that an analysis of the artifacts will help them to understand what type of craftsman owned them. For now, they suppose that the spoon drills and drawplate could have been used to produce thin wire bracelets. But, this kind of drill was also used to make holes in wood – suggesting that it could have also been a carpenter’s toolbox. Moreover, the location of the artifacts by the eastern gate of the fortress provides more information on the tools’ history. They could have been used after a fire that torched the fortress’ north and east gates in the second half of the 10th century. The team also found a room near the gate which could have been a workshop or used for housing a craftsman. It measures about 30-40 square meters (322-430 sq. ft.), and had its own fireplace. The researchers speculate that the tools were buried underground when the gate collapsed – explaining why the recovery of the valued iron objects would have been difficult. Now the researchers want to scan the tools by X-ray. That should help Holm’s team to identify exactly what the tools are. She already has some ideas, for example, that one of the spoon drills may be a pair of pliers or tweezers. It is planned that the tools will be put on display next year, although the artifacts need conservation work before they will be ready to be exhibited. The draw plate is interesting, Same basic process is still used in the present day to produce wire, by pulling it thru sucessively smaller dies. If this belonged to a craftsman, it was a talented one to do both metal-working and carpentry. I would have expected more specialization. Many articles were used in past for the control of things. The manner make possible for good and lovely control of things. The acts of such allow us for good results in reply. The needy past things seen in site <a href="http://www.ukessayspapers.com/" rel="nofollow">ukbestessays.com order</a> order for many ones. I look forward to the articles you provide and learn much from them.